What is environmental soil mixing? We’ve found that soil mixing is a great way of remediating contaminated soil and groundwater using chemicals and other compounds. Soil mixing is more regularly used for geotechnical ground stabilisation, where the technique is used to improve the structure of soil for construction. Environmental soil mixing is focused on the remediation of contaminated soil and water, and it is often tied in with improving soil structure as well. The reason for identifying the difference is that the design and implementation of environmental soil mixing can vary significantly from geotechnical applications and as such you should make sure you’re talking to the right people. The main challenge for environmental remediation using chemicals for processes including chemical oxidation, stabilisation, and solidification, is getting the treatment to the contaminant. We’ve had great success by injecting chemicals, however as an alternative technique soil mixing significantly increases the variety of ground conditions for chemical treatment, and the duration of a program of injections is generally a lot longer than it would be for soil mixing. Soil mixing provides the joint benefits of dispersing treatment materials thoroughly throughout the contaminated materials, while also physically breaking down both the soil structure and certain contaminant structures. Soil mixing is also used for the installation of permeable reactive barriers. Time can be a major factor in the decision to treat contamination on site instead of resorting to physical removal (e.g. off-site disposal). 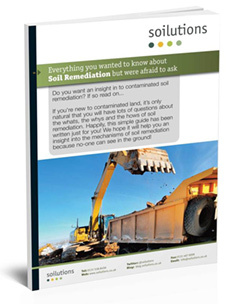 Once you have classified the waste then the only limitation for off-site disposal is how many excavators, tippers etc you can / want to use to move the soil. Disposal generally costs a lot more than treatment would, but it does provide cost and time certainties which are what most project managers really want, assuming the money can be spared. The remediation industry has always known that this is the case. I’m glad to say that the market for solutions which complete remediation within short time frames has improved significantly over the last few years. Technology has not necessarily changed, but the successful and quick application of several technologies has. Now all you need to do is identify which ones suit your particular scenario and for that you will need to speak to the professionals. A Remedial Options Appraisal can be a good place to start. The main time defining factor can be getting your ‘treatment technology’ to the contaminant, due to the generally complex interactions of contamination in soils this can be tricky and can take time, for example if we can get a chemical oxidant directly to the contamination, treatment can occur quickly, however if the oxidant is only coming in to contact with the edge of the contamination then not only will treatment take longer, several treatments may be required to achieve targets. Techniques to improve the mixing of oxidant and contaminant and therefore reducing treatment times include the application of surfactants to the soil in order to release the contamination, and/or mixing the contaminated soil and oxidant by mechanical means. There are many ways to speed up remediation, too numerous for one post. As always we’re happy to talk so feel free to e-mail or phone us (0131 538 8456). Fuel on the groundwater from a borehole! Hydrocarbons (better known as fuel or fuel oils to most people) can be relatively simple to remove from groundwater. A challenge often faced when remediating petrol filling stations. A silver lining for fuel oil remediation in the ground is that fuel floats on water which can mean that the majority of contamination is confined above the water table. Be aware that this doesn’t apply to biofuel! Some fuel will dissolve into the groundwater over time which can mean that groundwater treatment is required in addition to removal of the fuel floating on the surface of the groundwater. 1) Pump & Treat – pump groundwater up to the surface, and run through an appropriate treatment system. 2) Free phase removal – skim the fuel off the surface of the groundwater, this can either involve an active pumping system, or passive skimmers. The later often provides a low budget option for small areas of contamination or low volumes of free product. 3) In-situ treatment – addition of chemical oxidants, sparging the water with air, to name a couple. If you want to know more then we have a list of technologies on our web-site, see Soilutions’ services here. We’re always here to talk to if you’re looking for more site specific advice on 0800 0209 307.